Come hear the latest research and treatment news from Dana Parish, Dr. Neil Spector, Dr. Steven Phillips and 25 health fair exhibitors. 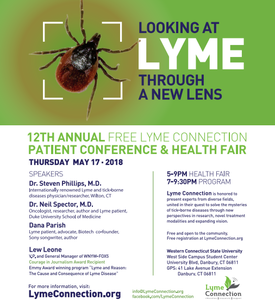 Join us for Lyme Connection’s 12th Annual Patient Conference and Health Fair--“Looking at Lyme Through a New Lens” -- Thursday, May 17, at Western Connecticut State University’s Westside Campus Student Center. Doors open at 5:00 p.m., giving attendees time to visit the Lyme-focused health fair, featuring tick-control products, Lyme-literate practitioners, diagnostic laboratories, and manufacturers offering prevention and patient support services. The evening program begins at 7:00 p.m. with the presentation of Lyme Connection’s second Courage in Journalism Award to Lew Leone, vice president and general manager of WNYW-FOX 5 TV. Attendees will then hear from internationally acclaimed speakers: Wilton, Connecticut based internist and tick-borne diseases specialist Dr. Steven Phillips; Duke University Oncologist Dr. Neil Spector (by video); and patient advocate Dana Parish. Admission is free thanks to the support of this year’s sponsors: Dr. Roseann Capanna-Hodge, Hopkinton Drug, IGeneX, Inc., Nutramedix, SOPHIA Natural Health Center, and Tick Box Technology Corporation.